In the new 250-page volume from Routledge's Studies in Social and Political Thought, Delaney examines everyday social interactions through a lens of what parents have taught their children through the ages: "Use your common sense: Don't touch a hot stove. Stay away from the water if you can't swim. Don't get near a wild animal." Uniquely, the author said, the book frames common sense on the same level as tradition, faith and enlightened, rational thought: as a model or pattern of thought, a way of viewing reality and a guide for behavior among like-minded people. "I always wanted to write a book about common sense," Delaney said. "I've been wanting to do this for at least 15 years. I've been saving articles for years in a folder. What I had always done is when any major social thinker had something to say about common sense, I wrote it down." Scholars from the ancient Greeks to modern sociological thinkers like Harold Garfinkel have tried to come to terms with the notion of common sense, he said. Delaney cites hundreds of theorists, philosophers, popular resources, agencies such as NASA and the National Traffic Council, and more, examining key theories of common sense in depth. Common sense is learned, he writes; it arises from experience, observation, education and socialization. "My grandfather always walked really slow on the ice. We called it 'the grandfather walk,'" Delaney said. "It always stuck with me. When you're younger, you might fall on the ice and pop right back up. When you get older, if you fall, you might break a hip. You learn to walk slowly, deliberately. Common sense." Delaney takes time to explore why tradition, faith and enlightened, rational thought are also paradigms. The latter did not come along until the 1700s, he said. "Then you have people promoting science, reason, pragmatism," he said. "'Let's apply science.' Enlightened, rational thought goes against two powerful paradigms of thought -- it really challenges tradition and faith." The book includes three appendices that list, respectively, numerous examples of common sense; what Delaney regards as the opposite, "common uncommon sense"; and his own life-experience "Tim-isms." A few common-sense Tim-isms: "Naked and afraid may be a TV show, but it really occurs every time you try to figure out how to use the shower in a new hotel or friend's home." "You do not need to water a plastic plant." "You cannot lose weight if you eat all day and never exercise." Delaney explores the weaknesses and limitations of each paradigm of thought. He provides a twist at the end of the book, when he discusses which one ought to prevail. Hint: It's not common sense. As with many of his other books, Delaney connects popular culture to his subject throughout. "Common Sense as a Paradigm of Thought: An Analysis of Social Interaction" is available on Amazon and at many other retailers. Other Delaney titles, some in concert with frequent co-author Tim Madigan of St. John Fisher College, include "Gangs in American Society," "Friendship and Happiness," "Contemporary Social Theory" and "Sociology of Sport." Delaney has taught many courses at SUNY Oswego, including "Sociological Concepts and Theories Through Television's 'Seinfeld." He and history faculty member Chris Mack co-host an annual symposium on sportsmanship, this year on March 7. Media across the country frequently invite Delaney for interviews. For more information about the sociology program at SUNY Oswego, visit oswego.edu/sociology or call 315-312-4190. 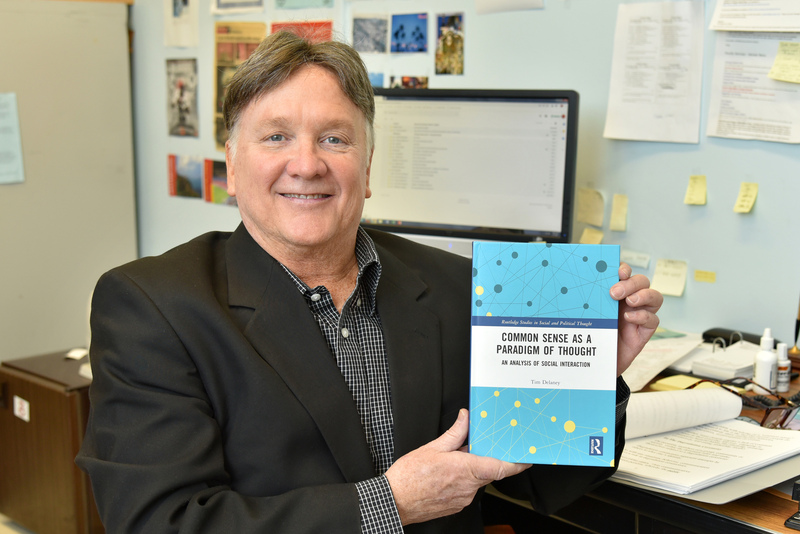 Patterns of thought -- SUNY Oswego sociology professor and chair Tim Delaney's latest of 21 books, "Common Sense as a Paradigm of Thought," invites comparisons with other models of thought: tradition, faith and enlightened, rational thought.